Make sure the surfaces you wish us to reglaze are clean and free of any debris. 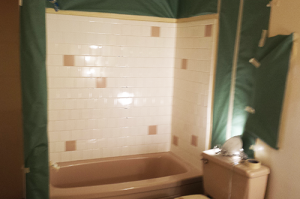 Also, remove shower curtains and other items that could fall into the glaze or hinder the project. If you have wallpaper in the room, let us know beforehand, so we can make preparations (our normal masking tape may harm the wallpaper). We can then take the necessary precautions to keep the rest of the room looking perfect. Be prepared not to use the room in which a surface is being reglazed for at least 24 hours after the coats have been put on. The fumes can be harmful to both humans and animals. Make arrangements beforehand, so you do not have to come into the room while coats are drying. We will come in and assess the current state of the tub, tile (including grout), countertop, or other surfaces we are reglazing. 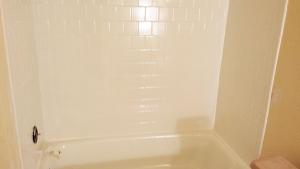 Some tile walls will need new grout before Rub A Dub Tub Reglazing can start the project. If the surface has previous coats of paint or glaze, we may have to sand to the original surface at an additional cost to ensure the new glaze bonds correctly. The colors we carry are white and bone. To ensure that our projects are done in a timely manner, you must be present to approve the color mixture of the glaze, or we will begin without your approval. We will not be responsible for any changes once we have begun reglazing. Once everything is ready, we can start reglazing. We do this by applying two coats of primer to the surface of tubs and countertops. We then coat the surface with at least three coats of an acrylic polymer. This coating adheres to the actual surface, creating a chemical bond. Finally, we apply a finishing coat to protect the previous coatings and to make it look great! We can also make your Formica countertops look just like Corian countertops. Save money on buying real Corian countertops by letting us use a creative stain that gives your countertops the same look. Please allow 24hours after the refinishing has been applied before using the surfaces. Make sure nothing (dust, water, etc.) makes contact with the glaze while it is drying. Do not use harsh or abrasive cleaners to clean the surface. Avoid leaks they can harm a reglazed surface over time. Make sure your bathtub is properly caulked to avoid water damage.